1) A half-hour before you start: Remove the salmon from the refrigerator, unwrap it, and let it sit on the counter to come to room temperature. Place a pan 1/2 full of water ( you can use a 8″ round cake tin) in the oven on the lower rack and preheat to 250°F. 2) Prep the herb paste: Finely chop the shallot, parsley, basil, and other herbs. Zest the lemon (A Microplane is the best way to go.) Mix the shallot, herbs, and lemon zest in a bowl, and moisten with the olive oil to form a rough paste. 3) Prepare the baking tray: Lightly oil a baking rack and place it over a tray. Place the salmon fillet skin-side down on the rack. 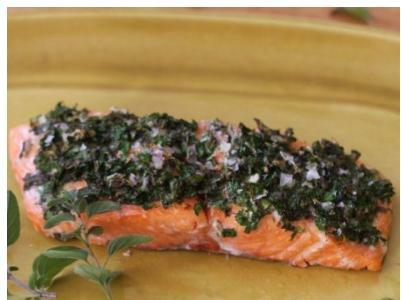 4) Coat the salmon with the herbs: Pat the herbs on top of the salmon, forming a thick layer. 5) Bake the salmon 25 to 30 minutes: Place the salmon in the oven on the middle rack and close the door immediately. Bake for 25 to 30 minutes. A thicker fillet will usually need a little longer time. Check for doneness at 20 minutes: Remove the tray of salmon from the oven and close the oven door. (Since the oven is at such a low heat, you want to keep the door closed as much as possible.) Place a knife tip in the thickest part of the salmon and gently pry it open. If the salmon separates into flakes, it’s done. If not, return it to the oven for another five minutes. 6) Garnish and serve: When the salmon is done, transfer it to a cutting board and cut into four pieces. To remove the skin (optional) work the edge of the spatula between the skin and the flesh. By gently wiggling, you should be able to lift the fillet clear of the skin. Sprinkle each fillet with the salt and serve. Salmon is a powerhouse of healthy goodness. It contains omega-3 fatty acids, can improve cardiovascular health, excellent source of Vitamin D and contains high levels of DHA. DHA is important to pregnant women because it improves the baby’s brain development. Eat salmon pregnant ladies; in moderation of course. Neil hates fish. Why? I have no idea. He HATES when I cook it at home. However, salmon barely smells when baked in the oven. The microwave is another story but cooking salmon in the oven is almost undetectable. This is an easy weeknight recipe. I hope you enjoy.